In only a few days, Emotiv has raised nearly half a million dollars, far more than its campaign goal of $100,000, to develop a "neuroheadset" called the Insight. The Insight is a wireless 5-channel headset that records brainwaves so users can allegedly improve brain performance and turn data into commands to interact with computers, operating everything from apps to wheelchairs. 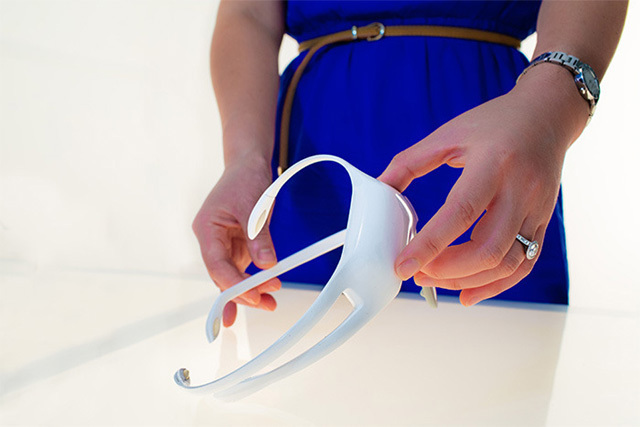 Emotiv is behind the popular EPOC neuroheadset, and the Insight is a significant redesign. It's simpler and lighter, and looks more like a bird perching on your scalp than an ungainly squid. It has a polymer biosensor system that eliminates the need for conductive gel or saline solution; users can slap it right on and start cranking out electroencephalography (EEG) data through the dry sensors. The device only has five EEG sensors and two reference sensors, but can apparently cover enough key cerebral cortex areas to generate brainwaves for a wide variety of applications. Slated for launch next year, the Insight will come with a free Android and iOS mobile app that's designed to track and help improve everything from attention to relaxation while curbing stress. The Insight can also "detect commands such as push, pull, levitate, rotate, and even commands that are harder to visualize such as disappear," the campaign page says. "It also detects facial expressions such as blinks, winks, frown, surprise, clench, and smile." Emotiv is planning SDKs and APIs for Android, iOS, OSX, Linux, and Windows, opening up a range of other uses. A Research Edition SDK will give users access to raw EEG data. The campaign is offering the Insight to backers for about $200. Would you wear one of these things? Maybe with a Google Glass for maximum effect? Emotiv is also launching a crowdfunding campaign on Kickstarter on Thursday, August 1st! Early supporters can expect special pricing, exclusive perks, extra content and of course the privilege to be the first to get the Emotiv Insight headset.